This tutorial builds upon Managing Products but explains downloadable products specifically. 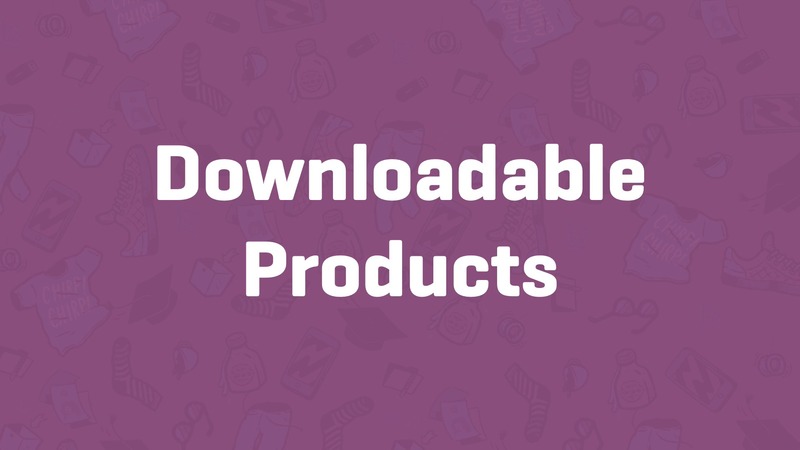 Go to: WooCommerce > Settings >Products > Downloadable Products. Select a File Download Method from the dropdown. Redirect only – When users download a file, their link redirects to the file. 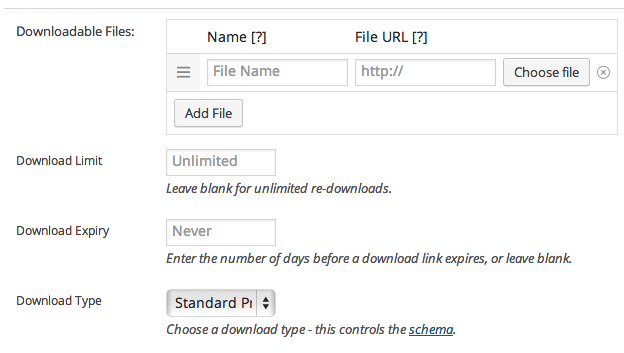 Force Downloads – File downloads are forced, using PHP. To ensure files are protected from direct linking, Force Downloads can be used. Files are served by PHP. However, if your files are large, or the server is underpowered, you may experience timeouts during download. In this case, you need to either look at your server or use the redirect method. X-Accel-Redirect/X-Sendfile – Downloads are handled by the server (nginx/apache). This method requires the X-Accel-Redirect/X-Sendfile module be installed and enabled on the server. Confirm with your web host that one of these modules is installed before using this method. It’s the most reliable method because the file is served directly to the customer and gives you the best performance. Files are also protected by an .htaccess file, making it secure. Select a level of Access Restriction. Tick the Downloads Require Login checkbox if you want users to be logged in to download files. Guest checkout would need to be disabled. Tick the Grant access to downloadable products after payment checkbox if you wish to grant access to files when orders are Processing, instead of Completed. Go to: WooCommerce > Products > Add Product to add a new Simple product as outlined in Adding and Managing Products. Tick the Downloadable checkbox.After ticking this box, other options appear: Downloadable Files, Download Limit, Download Expiry, Download Type. 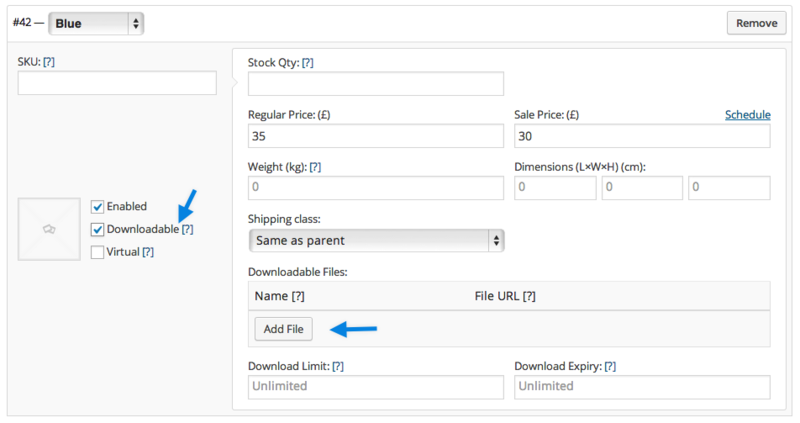 WooCommerce supports multiple files per product! In prior versions, only one file was allowed per product. Multiple files required packaging in a ‘zip’ file. Enter the Download Limit (optional). Once a user hits this limit, they can no longer download the file. Enter the Download Expiry. If you define a number of days, download links expire after that. Select the Download Type from the dropdown. Variable products can also have downloadable variations. When adding a variation tick the Downloadable checkbox and more options appear. Options work the same as regular products: Set the file path, optionally choose a download limit and expiry, and save. If you tick the Downloadable checkboxes, products can have stock and are treated as physical products. This allows you to sell downloads and real products together. If you want to add/sell a downloadable product that is not physical, also enable the Virtual option. User adds product to their cart. Users checks out and pays. If items in the order are all downloadable + virtual, the order is complete. If items are physical and downloadable/virtual, the order is processing until you change it. Users can then download files. Customer receives an invoice/order confirmation with clickable link to download, if order is processed and paid. Go to: WooCommerce > Orders and select the order you wish to view or edit. Scroll down to the Downloadable Product Permissions meta box, which displays the download and how many times the customer had accessed it. Revoke access, grant access to new downloads, or exit order. Downloads of digital/downloadable products have unique IDs that are tracked and logged in Reports. More at: WooCommerce Reports.